Front row from left to right: RJ Sells, Ethan Hile, Corinne Pickl, Vipin Gupta. Back row from left to right: Josh Flannery, Caroline Buckey, Neev Gupta, Vishnu Avathsa, Krishna Suresh, Rao Avanthsa, Lakshmi Avanthsa, Terri Pickl, Terence Chu, Bill Pickl, Darrin Hile, and Subha Ambigapathy. In front of the robot is Neev Gupta. Behind the robot is Rao Avanthsa. 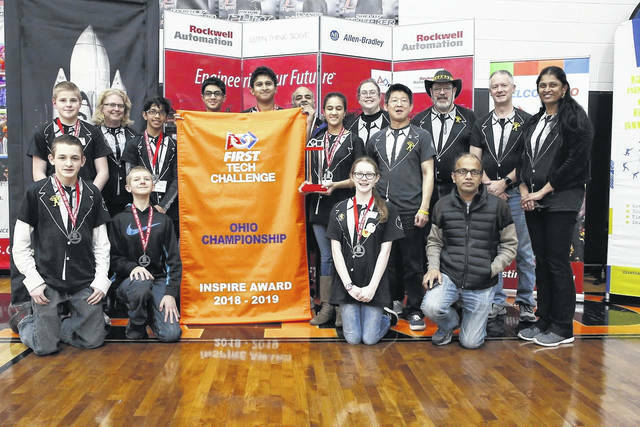 COLUMBUS – A local Middle- and High-school robotics team won the Ohio State Championship again. 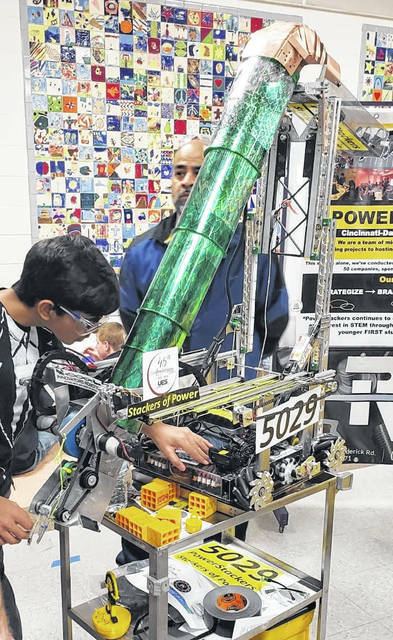 PowerStackers, a FIRST Tech Challenge robotics team, is on its way to the FTC World Championship for the third year in a row. Held in Detroit, Michigan, the World Championship is an international competition featuring some of the world’s best and brightest young engineers. PowerStackers is one of only six teams to advance from the Ohio State Championship. PowerStackers, along with their alliance partner, had a highest-scoring match with 417 points which is also the top 20 in the World. Their “Dayton Dragon” Robot stretches out its neck with green scales, and quickly shoots up blocks into the goal. Coached by Mr. Terence Chu (Englewood), Mrs. Caroline Buckey (Fairborn), and Mrs. Subha Suresh (Blue Ash), PowerStackers spans across the Dayton/Cincinnati area, with 13 student members ranging from 7th to 12th grade, from Englewood, Huber Heights, Blue Ash, and Mason. Team PowerStackers has existed for 15 years. This year will mark their fifth time competing at the international level, and their third consecutive year at the World Championship. This season alone, PowerStackers has hosted over 80 regional outreach events, and reached out to almost 100,000 people. There is a good chance you have seen the PowerStackers at the National Museum of the U.S. Air Force, Dayton Air Show, HamVention, Sinclair’s Tech Fest, iSpace STEM Day and even at a Dayton Dragons Game. Their commitment to their community has earned them the title of Ohio FIRST Ambassador and Ohio Showcase team, as well as a regional Motivate Award (1st place) and the coveted Inspire Award (1st place) at the State Championship, and a few design award finalists. FIRST (For Inspiration and Recognition of Science and Technology) is a non-profit organization that introduces families and children of all ages to the world of STEM. FIRST Tech Challenge (FTC) is one of four robotics programs offered to kids age 6 to 18: FIRST Robotics Challenge, FIRST Tech Challenge, FIRST Lego League, and Jr. FIRST Lego League. With each new season comes a new set of obstacles and gameplay mechanisms. Every team builds and programs a robot in response to the challenge, then competes in several high-energy tournaments. In addition to building and programming, students learn to work as a team, develop Gracious Professionalism (good sportsmanship), hone their business skills, and become adept at the presentation of their ideas. Through this season’s space-theme challenge, Rover Ruckus, students are tasked with creating a robot with a multitude of capabilities — including the capacity for autonomous movement, the ability to deposit particles in raised receptacles, and the precision to maneuver around/across obstacles. This season has raised a number of challenges, but PowerStackers has managed to emerge victorious once again. Team PowerStackers will compete on the world stage at the Cobo Center, Detroit from April 24 through the 27. If you are interested in FIRST program or would like the PowerStackers to outreach to your business/organization, you can email the team at PowerStackers@gmail.com, visit their website at powerstackers.wixsite.com/site, or visit FIRST’s website at firstinspires.org.